Our fourth annual Pop-Up family-festival will feature installations dreamed up and built by teams of local designers, artists, engineers, and contractors. The installations will transform spaces in Ybor City's historic district - alleyway, storefronts and sidewalks will demonstrate their true potential. Architecture firms, museums and restaurants will also open their doors. A glimpse at the industries that founded Ybor—cigars, bread and coffee. This installation will project films about those core industries in the storefront windows while exhibits inside will provide information and showcase actual workers. An interactive alleyway installation where visitors can write their own messages and present them to the Lucky Cat ‘shrine’ at the end which is said to grant wishes or thoughts. This installation is meant to attract visitors into unvisited places in Ybor. Set in an alleyway, it consists of illuminated wood panels which provided seating, shaded by organic fabric, the elements make the space more inviting. The team of USF students will be creating pockets of inhabitable space and rethink the concept of ‘walls’ and ‘canopies’. This installation will segment the existing space with panels and a canopy will stretch overhead to create a sense of privacy in the alleyway installation. This intervention will challenge the perception of alleyways. It is normally perceived as accidental spaces between buildings; dark, dirty, and backdrops to crime. Our proposal is inspired by the notion of lanterns to redefine the spaces into a safe, inhabitable social hub. The installation can act as an alternative path defined by seating. The effort is going to explore different types of relationship between illumination and structure. At last the installation will address both the use during the day and night. Daily walks through this neglected space can become a highlight for Ybor exploration and or a gathering area for the community. This team will present their take on sustainable living via a re-imagined herb garden made for commercial and industrial areas like Ybor. The herb garden, made of organic and recycled materials, is filled with Cuban oregano, mint, cilantro and many other herbs traditionally used in Cuban cuisine as an homage to the city’s roots. By using ancient Camera Obscura technology, this exhibit will provide an interactive experience for visitors in and outside the Center of Architecture and Design. Graphics will be projected, capturing the history of the building. Come check out a special exhibit by elementary school students who are learning about the impact and importance of architecture and design. In addition, experience Traction Architecture's installation Traveling Obscura, a machine that uses ancient Camera Obscura technology to augment storefronts, transforming them into a device for observation and contemplation of street life and the surrounding context. Grab some snacks along the way, and claim your Pop-Up Festival wristband to enjoy our participating venues' offers! The Chamber’s Visitor Information Center at Centro Ybor is a resource for everything Ybor. It’s housed along with the Ybor City Cigar Museum in the world’s largest cigar box and provides information about Ybor attractions, Ybor history, and other fun places to visit in the Tampa Bay area. Many people, including the general public, out-of-town visitors and even the media rely on the chamber as a source for information and referrals. Come in and sit in a replica of the cigar roller’s chair as you view the 10 minute video on the stories of Ybor’s culture and learn about the Ybor City National Historic Landmark District and its architecture. A traveling exhibit featuring seven of Tampa’s top baseball professional will be on display. The future museum is located in the historic home of Al Lopez, Tampa’s first professional player, manager and Baseball Hall of Fame inductee. The Lopez house, which was moved approximately one mile from its original location to make way for the Interstate, is a “casita” in the style of a typical cigar-worker’s home. It has been extensively rehabilitated to preserve its exterior look and character and accommodate the museum’s exhibits on the inside. When completed, the museum will present 130 years of Tampa’s baseball history and heritage. Visit the Museum located in the 1923-era Ferlita Bakery, where you will find exhibits on the cigar industry, the immigrant groups who settled Ybor City, the social clubs and mutual aid societies, and important events and eras related to Ybor City’s unique cultural heritage. A special exhibit, Traces of Cuba, is on display and you can see the bakery’s original ovens. Take a break in the lush and picturesque Museum Garden or tour the "casita," representative of a typical cigar-worker's family home. Free admission with Pop-Up Festival Wristband! Come check out the Courtyard of this Mediterranean Style Villa with a facade comprised of Old World Earth Tones. Casa de Lala was constructed in 1930 and was built by John Lala founder of the Lala Produce Company of Ybor City. Located in the Historic Sans Souci Building. Check out their newly renovated space and don’t miss the original billboard advertisement for Creme of Kentucky “Thee” Whiskey painted on the east interior wall before 1906! In addition, AIA Florida 2015 Firm of the Year is going to open their doors to showcase their architectural work. Stop on in and see the Historic Katz Building exterior restoration and second floor interior renovation by AIA 2017 Firm of the Year. The exterior facade was restored while the second-floor interior re-design complements the 100 year-old building. Wood panels recycled from Northeastern farms, aged copper tiles combine with modern finishes to bring a simplified Age to the collaborative work environment. Open house from 12:00-2:00 pm. Located in the historic Site of the first Ybor City Railroad Station (1887). “Through this station passed conspirators, spies, and many notable leaders of the Cuban Revolutionary Junta”. It has been the home for Alfonso Architects, Inc. an award-winning design firm and recognized leader in innovation and design for over 30 years. Come join us to learn about outgoing projects and get to see this inspiring, creative, historical renovation! Enjoy $3 Margaritas, Sangrias, Sangritas, Finlandia Martinis and All you Can Eat Fajitas for $9.95! Enjoy 15% off your lunch order. No drinks included. 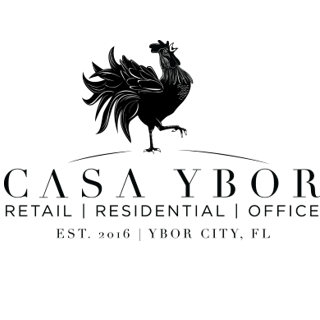 Tampa Bay's own Center for Architecture and Design is now LIVE in Ybor City. Join us as we cut the ribbon in honor of the new space and enjoy a reception and exhibit entitled ARTchitecture. Enjoy 15% off your food order with TBDW Wristband. No drinks included. Merging the worlds of design and photography, Williams B. Pontel from American Olean and Terri Fleming of Gulf Tile & Cabinetry will give a presentation about the applications and techniques of digital printing on tile. The presentation will count as 1 HSW CEU for all attending. Following the presentation, FMoPA members and lecture attendees will have the opportunity to network, discuss design and photography trends and view work from emerging local photographers. Follow us and join our mail list to be notified about news and event calendar updates!